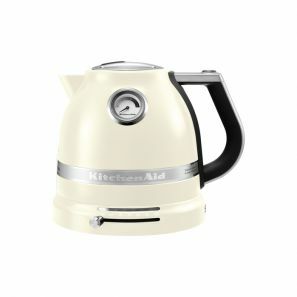 5KEK1522BAC At last Kitchenaid have unveiled their long awaited resilient and stylish electric kettle. Combining striking design and the best technology available, this kettle takes the monotony out of boiling water any time of the day. Its smooth rounded design and dual wall construction guarantees a quick and quiet boil, and with a 3kW concealed heating element you will not be left waiting long for a hot drink. An innovative adjustable temperature setting can heat water from 50°C to 100°C in 10°C intervals. This means you can select the perfect brewing temperature for delicate herbal teas or speciality coffee blends. A temperature gauge is also on hand to keep you alerted to the inside temperature, even when the kettle is off its base. Even when this kettle is boiled the exterior remains warm to touch no more burns when you accidently brush off it. The Artisan kettle features an ample 1.5L capacity, soft-touch handle for easy grip and a backlit water window. A stable 360° base with non-slip rubber feet and cord storage tops off this model.